A major highlight of my Mexico trip was to see Chichen Itza. As most of you know, Chichen Itza is known for its Mayan Ruins. It is perhaps the largest, most famous and most accessible Mayan site, located about 125 kilometres west of Cancun and Cozumel. Rightly so, its considered as one of the wonders of the modern world. 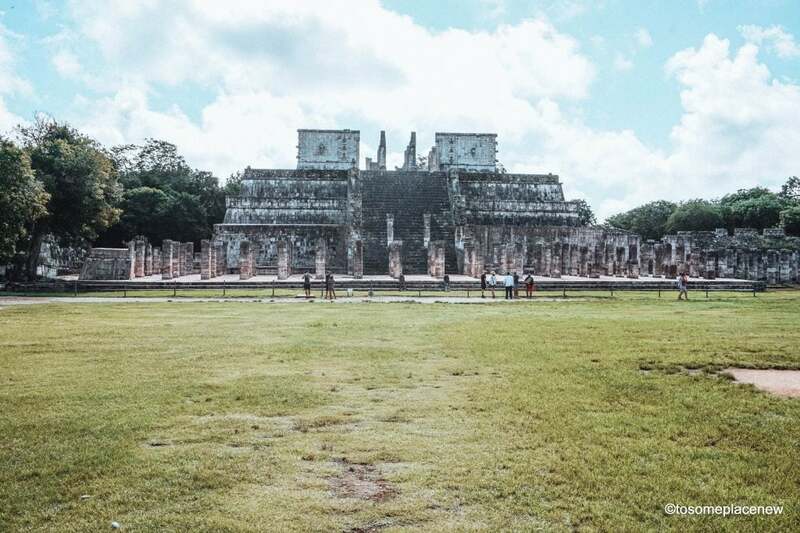 It was intrigued at the history of this place, fascinated by what the ancient Mayans discovered and the sciences that they have preserved over the years. 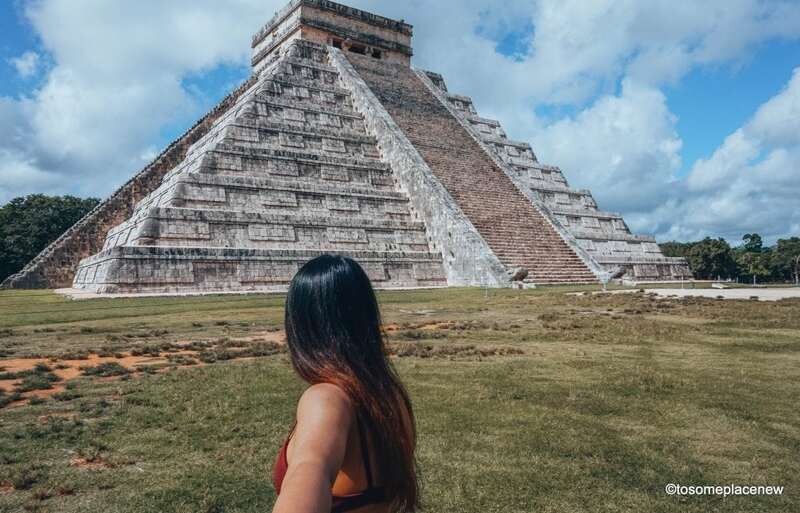 We were so excited to learn more about its history that we decided to take a private tour to Chichen Itza. Chichen Itza is an archaeological site located in the Yucatan region of Mexico. It is one of the most visited locations in Mexico. 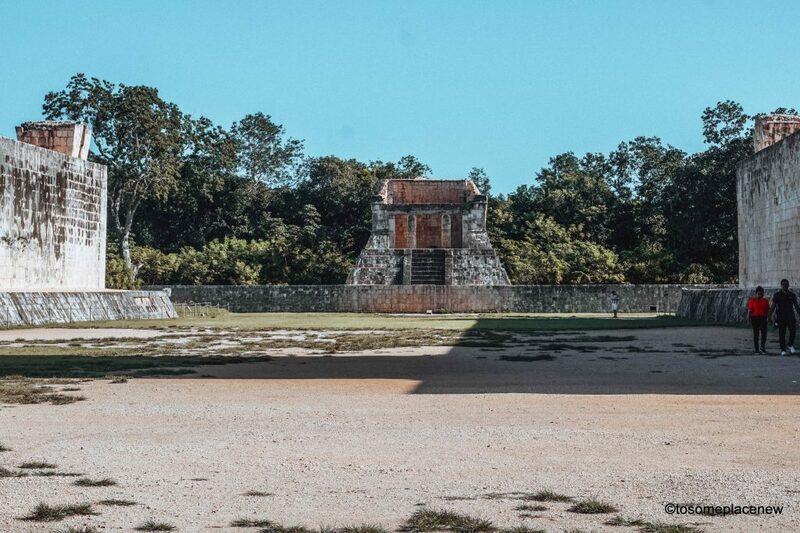 Known for its rich Mayan history,the entire complex is over 1,000 years old. The Mayan name “Chichen Itza” means “at the mouth of the well of the Itza.” And as you read along, you will know why! The main pyramid, called the El Castillo or Temple of Kukulkan is the most popular. There are many other architectural structures in the complex as well that are of historical significance to the Mayan culture and researchers alike. 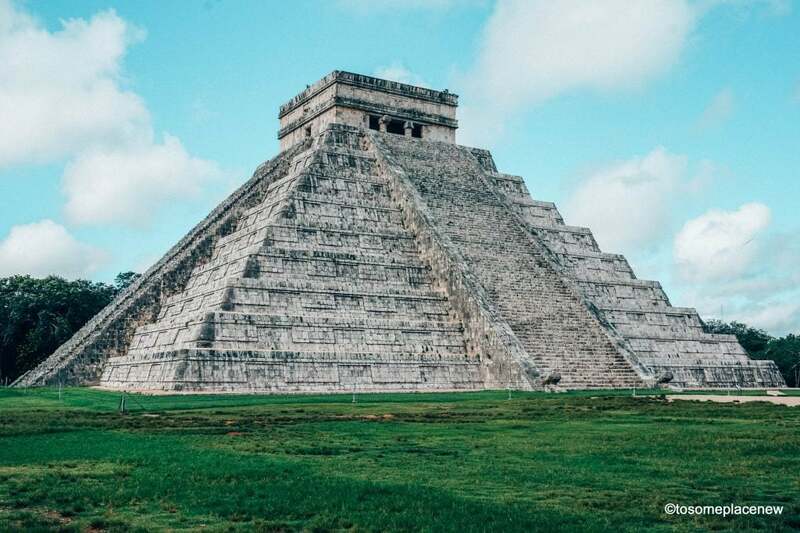 If you are staying at a resort in Cancun or Playa del Carmen, it will take you around 2.25 hours to reach Chichen Itza. Same duration from the Cancun International Airport – if you wish to start exploring as soon as you land. We decided to book a tour with a local company for this trip. We chose Amigo Tours and booked their early morning Chichen Itza tour with a guide. The cost of the tour was $54.00 CAD per person and included entrance fees to the site, lunch and pick up/drop off from our Playa del Carmen resort. The entire tour took us about 7 hours and we were at the resort by 3:30 pm local time, to relax at the beach. Although booked as a group tour, we were given the perks of a private tour, as we were an English speaking group, with just the two of us. Our guide, Marco, covered everything about Chichen Itza including their history, current events and initiatives and also included fun activities. I was so excited when we reached the archaeological site of Chichen Itza. We started early in the morning, around 6:00 am and we arrived at the archaeological site at about 08:30 am. Our tour guide arranged for the passes and we all quite excited to learn more about this beautiful site. Chichen Itza ruins are a federal property and the entrance fee is about 232 pesos for an adult. The entrance fee to the site is divided into two amounts, one being the state (culture) and the second being the federal. The land under the monuments had been privately for a long time. After the entrance gate and just before reaching the main pyramid, you can see water bodies called cenotes. All the cenotes in the region are connected to each other and are considered scared by the Mayans even today. Our tour guide took us directly to the main pyramid of El Castillo. It was bright and sunny that day (September) and we had the entire complex to ourselves. The pyramid is massive. It has 91 steps leading to the top, with figurines of the serpents at the base of the steps. Few days prior to our arrival (September 22 to be exact) the entire site was filled with tourists, historians and astronomers to witness the wonderful sight where the sun aligned with the peak of the pyramid and the serpent. The Autumn equinox as its called, the northwest corner of the pyramid casts a series of triangular shadows against the western balustrade on the north side that evokes the appearance of a serpent wriggling down the staircase. The El Castillo or the temple of the Kulkulkan dates back to the 9th century. Its believed to be dedicated to the serpent deity, KulKulkan. Each of the pyramid’s four sides has 91 steps. In the past, tourists were allowed to climb up the steps and reach the top court, but not any more. The 91 steps on each sides sums up to a total of 365 (including the temple platform on top as the final “step”) which represents the 365 days of the year. I was so fascinated with such scientific facts that it was mind blowing to say the least. The Mayan civilization is one of the oldest civilizations of the world and they were so far ahead in terms of science and astronomy. They built such structures without the use of many instruments or metals of any kind. They were great observers of nature and believed in recording everything. They recorded the change in seasons, time and reasons of why certain events occurred and how to resolve them. The only thing they didn’t record is “how” they built these massive and accurate astronomical structures. As you walk away from the main pyramid you will see a whole area full of columns. This area is called the Temple of the Warriors. The Temple of the Warriors is a three-level pyramid with neighboring colonnades on two sides creating a semi-enclosed court. The building at the top of the pyramid has a doorway framed with feathered-serpents and two chambers; one contained a chacmool and the other a throne. Buried within the base of the temple is another, older structure known as the Temple of the Chacmool. The interior walls of the temple were decorated with wall paintings showing scenes of warriors with captives, a lake, and thatched houses, all with some attempt made at achieving perspective. The total number of columns here is 260, signifying the total of 260 days in Mayan cycle. To summarize this theory in general, it is hereby put forward that the Maya specifically created, or rather invented, a 260 day cycle in order to allow them to accurately track the occurrence of successive conjunctions involving the Earth and Venus, over a full 2000 year grand cycle. So that this might be achieved, the 260 day period of the Mayan calendar was further combined with a basic Earth year of 365 days, as a means to generate an extended 52 year period of time. The Mayans regarded the number 13 and 9 as very scared. Considered as a scared number, the number 13 is synonymous with spiritual connection with the Great Architect of the Universe(God). The number 9, refers to the 9 planets, deities and worlds in Mayan civilization. Archaeologists have identified thirteen ballcourts for playing the Mesoamerican ballgame in Chichen Itza. 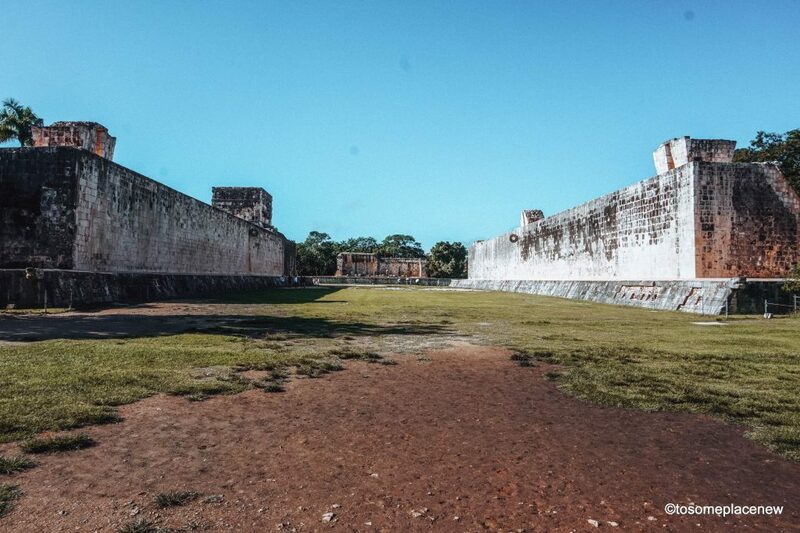 The Great Ball Court located to the north-west of the Castillo is the most impressive of all. The parallel platforms flank the main playing area and the walls of these platforms stand are set high up in the center of each of these walls. There are rings on them, carved with interwined featured serpents. At the base of the high interior walls are slanted benches with sculpted panels of teams of ball players. We discovered something very interesting in this ball court area. Depending on what spot you stand on you can actually hear some whispering something from one end of the site to another. So, if you are standing at the base of the courtroom facing them, you can hear your team mate whispering from the end of the ball-court. In and around the ball court area, you will find a lot of structures dating different historical periods. Some of the structures are in poor shape, almost most of them have also lost the color (historians believed it was red in color). Some of the other structures include – the Platform of the Eagles and the Jaguars, the Platform of Venus (dedicated to the planet Venus),the Temple of the Tables, the Steam Bath ( a unique building with water bath and a steam chamber operated by heated stones) and lastly a causeway leading to the Cenote Sagrado nearby. The Osario is a step-pyramid temple dominating its platform.There is a temple on top which leads to a natural cave 12 metres (39 ft) below. There many several skeletons and artifacts such as jade beads,found in this area. Archaeologists believe neither that the structure was a tomb nor that the personages buried in it were priests. There is a temple located outside the Oosario platform as well. 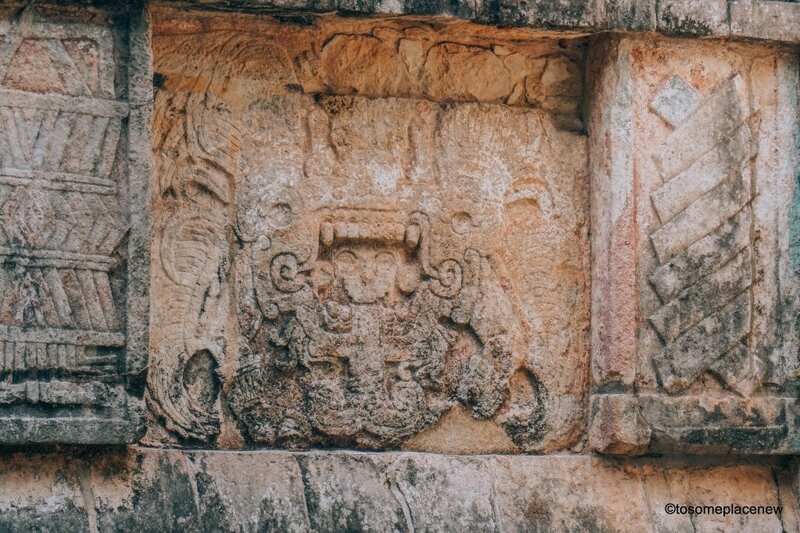 It overlooks the other large cenote at Chichen Itza, named after the Maya word for iguana, “Xtoloc.” The temple contains a series of pilasters carved with images of people, as well as representations of plants, birds and mythological scenes. The image below is situated at the end of the ball court. This seat was for the ruler and a “guest” who would then watch the players display their game. Being a religious and ceremonial site, all the ball games were used for worshiping purposes. The winner of the ball-game is sacrificed to the Gods to keep them happy. The winner was chosen as he is considered the best of the breed. It was a matter of pride to be sacrificed. Chichen Itza is classified as one of the New Seven Wonders of the World and in 1988 was enlisted as an UNESCO World Heritage Site. The term Chichen Itza means ‘the mouth at the well of Itza’. It is believed Itza means ‘water magicians’, deriving from the Mayan Itz for ‘magic’ and á for ‘water’. 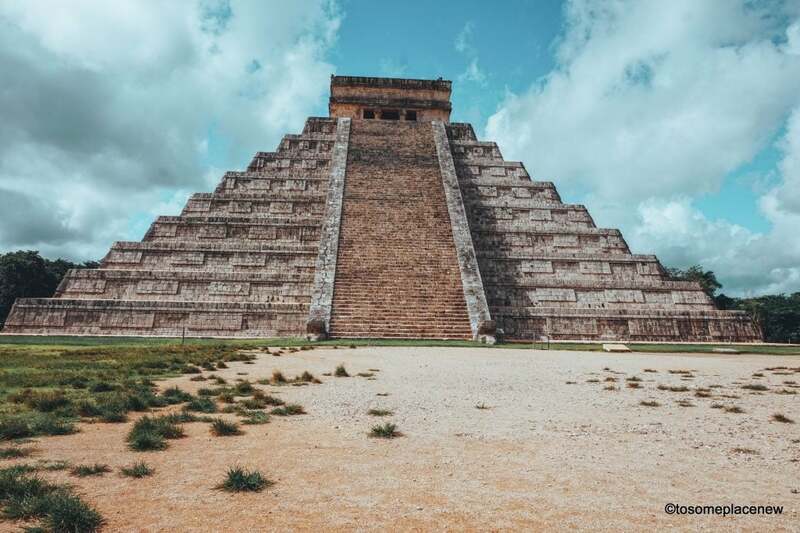 El Castillo (the Temple of Kukulkan) is the famous pyramid which dominates the site of Chichen Itza and it actually sits on another much older temple. During the Spring (20th of March, some historians claim its June 21) and Autumn Equinox (22nd September), sun rays create a shadow across the Kukulkan Pyramid that gives the appearance of a serpent slithering down the staircase. Best time to visit is from November end to March, when the temperatures are not too hot. Spring and Autumn is great to witness the equinoxes. The ruins are open daily. Many of the sites in Chichen Itza are known for their unusual sounds. If you clap once from one end of the Ball Court, it produces nine echoes in the middle of the court. Additionally, a clap in front of the Kukulkan Pyramid creates an echo resembling the serpent’s chirp. The Chichen Itza complex has lots of stalls selling Mayan souvenirs, including mini Chichen Itza pyramids, blankets and masks. They are said to be made by local Mayans. Be careful though as some of the items could be priced a bit higher as the vendors have to pay to the private landowners for using the stalls/land use. I bought a small handkerchief from an old Mayan lady (for $1USD). Also got a blanket for $12 USD and a small pyramid for $2 USD. Try to arrive early to get some amazing shots, including the sunrise above the pyramid. Ideal time is to reach the site by 08:00 am local time and be the first one to access the site. After 10:30 am or so the area gets crowded with tourists. Chichen Itza was more then a religious and ceremonial site. It was a sophisticated urban center and a hub of regional trade. Today you can wonder and marvel at the sophistication at which the Mayans built this place. The Mayans believed that knowledge is power. They were great observers of nature and seasonal changes. They recorded and recorded everything they saw and achieved perfection in their skills. Our guide said (Marco, archaeological guide), “As long as you set your heart in it, you will succeed, just like the Mayans did”. This is getting me so excited! We are going next week, but doing it on our own. Your photos are amazing by the way! We are hoping to get there early before the crowds, hope our photos turn out half as good as yours! Thanks so much! Glad you liked the pictures! I love this guide!!! This is high on my bucket list. And I must say your dress is gorgeous and I love your photos! What time was your tour? You was able to get a lot of clear shots! My tour pick up time was 6:00 am and we were there at 8:00 ish. Great write up. I know nothings of the Mayans. As a teenager I explored some ruins, but that was when I was immature and didn’t care learn anything. But now that I am reading this, it is making me want to go back to actually experience it. It is interesting how they sacrificed the winner of the Ball game and I can’t believe they were happy about it. Nevertheless Mayan history is so fascinating and these ruins so beautiful! Hope you can revisit soon! I am dying to visit this! I have been in Cancun but never made it, next time for sure! Absolutely gorgeous photos! I love all the historical and political facts behind Chichen Itza 🙂 Great to know that you should arrive by 8 am. Absolutely, starting early is the key to get some amazing shots! Woah this is amazing! I’ve seen SOOooOO many photos of this place but never knew a single thing about its history or intricacies. I think the most mindblowing fact for me is how the light shines through on the Equinoxes. That is crazy. Awesome post – definitely saving it for my future travels in Mexico! Thanks babe! Glad you found this post useful. I am sure you will be blown away when you visit in person! Wow those ruins are impressive!! I love it when you can combine travel with history, there’s so much to discover in this world. Aww.. you are so kind. Thank you so much! I loved Chichen Itza when I was there! It’s an incredible structure, and one that everyone needs to see when in Mexico. Great photos too! Thanks so much. We had a great time there too! This is an awesome guide! I love ancient ruins but I haven’t went to this one yet. 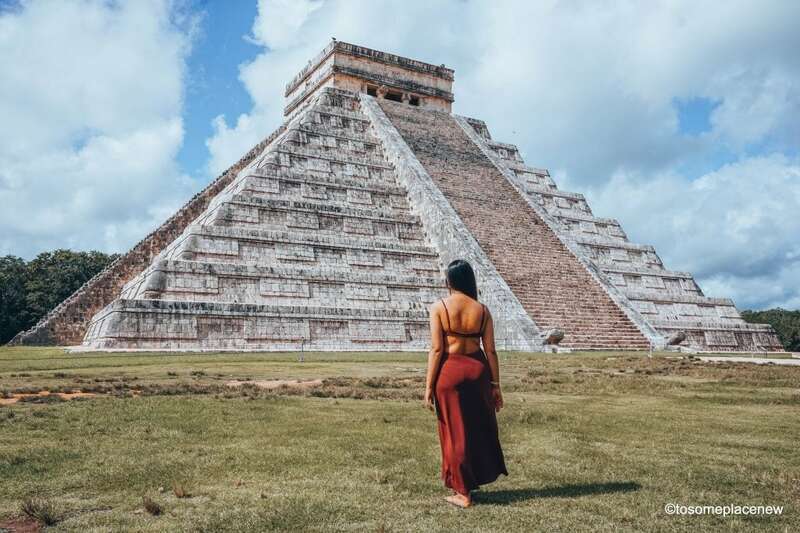 I love that you put together the interesting facts and tips at the end 🙂 We opted for diving instead of chichen itza on our one free day, so this means we have to go back right? 🙂 🙂 I booked marked this for our next trip! nice blog and nice pictures! 😊 my friend and i will go there in may. do you have any tips for us how to go there or can you recommend some company or guy who might bring us there?